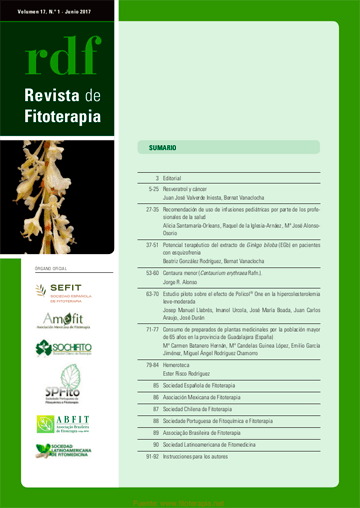 European Scientific Cooperative On Phytotherapy. 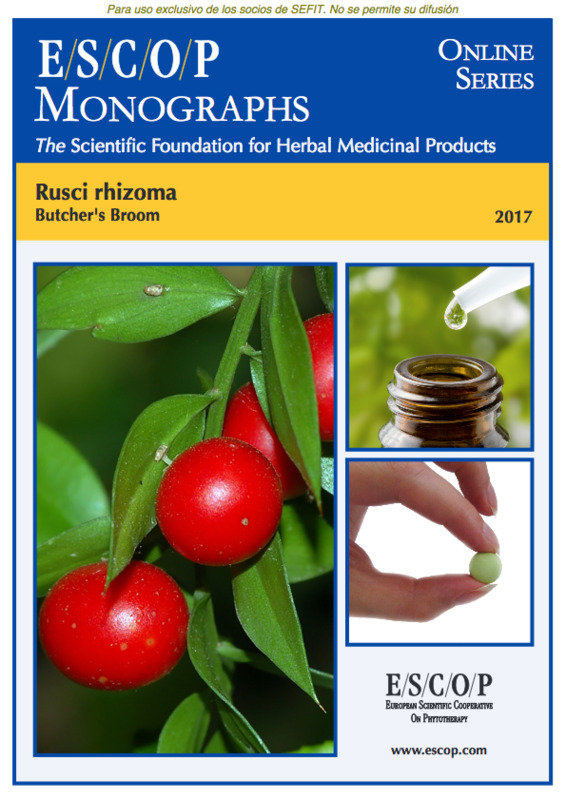 ESCOP monographs The Scientific Foundation for Herbal Medicinal Products. Online series. Uncariae tomentosae cortex (Cat’s Claw Bark). Exeter: ESCOP; 2018. Uncaria tomentosa (Willd. ex Roem. et Schult.) DC. 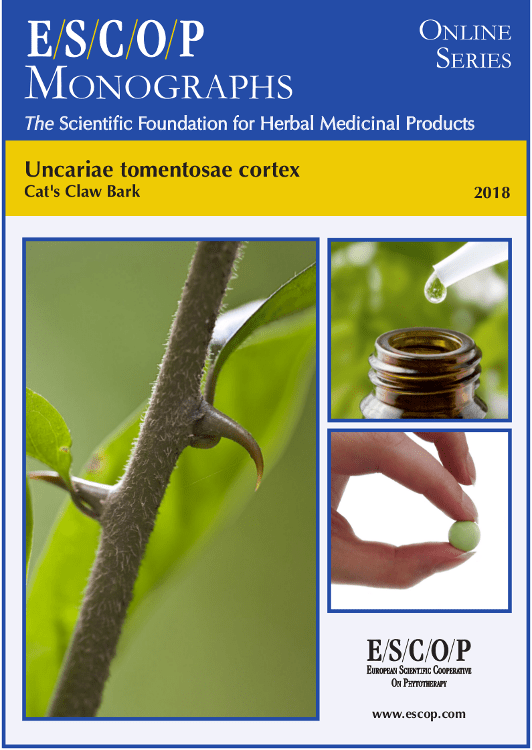 The herbal monograph selects and summarises scientific studies and textbooks regarding efficacy, dosage and safety to support the therapeutic uses of cat’s claw bark. This herbal drug by definition consists of the inner stem bark of Uncaria tomentosa (Willd. ex Roem. et Schult.) DC. Studies with its main characteristic constituents oxindole alkaloids, quinovic acid glycosides, polyphenols and procyanidins are included. The therapeutic indication is as adjuvant for the treatment of mild inflammatory conditions. Administration of cat’s claw bark addresses posology; its duration of use; contra-indications; special warnings; special precautions for use; interactions with other medicinal products; other forms of interaction; in pregnancy and lactation; its effects on ability to drive; undesirable effects; overdose. In vitro experiments with cat’s claw bark demonstrated anti-inflammatory, antiviral, antioxidant, anti-proliferative and cytotoxic effects as well as effects on immune functions. In vivo experiments with cat’s claw bark or its extracts in animals demonstrated anti-proliferative, cytotoxic, reno-protective and antimutagenic effects and effects on CNS and immune functions. Pharmacological studies in humans concern persistent response to pneumococcal vaccine and antimutagenic activities. Controlled clinical studies with cat’s claw bark in humans demonstrated its use for reducing side effects of chemotherapy in patients with breast cancer and improving life quality, social functioning and fatigue in terminal cancer patients without further medical treatment. No adverse events, except possibly gastritis, could be clearly attributed to cat’s claw bark. The selection of literature cited in the monograph is aimed at bringing together relevant information about the possible physiological roles of cat’s claw bark and its major constituents.